The least expensive method to increase your fuel economy and horsepower is adding a high-quality cold air intake system. Cold air intakes move the air filter outside of the engine compartment allowing cooler air to be sucked into the engine for combustion. Cooler air brings more oxygen (denser air) into the combustion chamber, which produces more horsepower. K&N is the clearly defined leader in the cold air intake field. 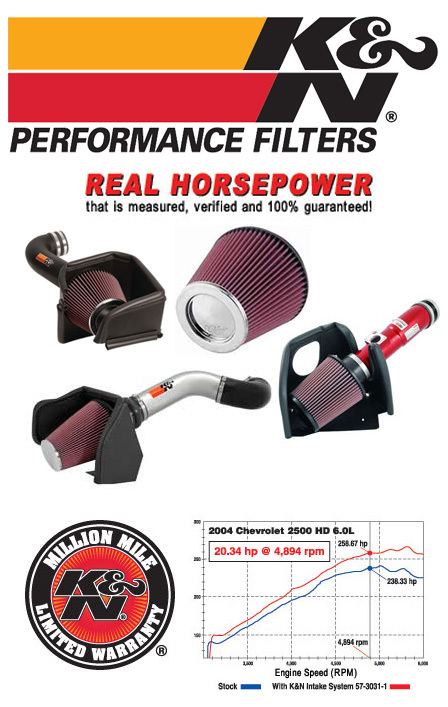 We feel a high quality performance intake system is one of the best dollars to horsepower investments you can make and once again K&N is the clearly defined leader. We built our first kit in 1992 and haven't looked back since. We currently manufacture over 500 different part numbers and our team of engineers is designing, building and testing new systems constantly. Our systems are built for horsepower. In fact on the 2003 Ford Mustang SVTÂ® we get an impressive 30 horsepower. If we can't increase a car or truck's horsepower we won't build a system for it. It's that simple. We establish a stock baseline horsepower with our in house dynamometers and then design our air intakes to get the largest horsepower gain attainable without causing a "Check Engine Light" to come on. Our horsepower numbers are not based on the single biggest gain from one particular vehicle but are an average of runs and vehicles. Many times an identical vehicle will perform differently so we want to ensure repeatable numbers you can count on. In today's market place there are some pretty big cold air intake claims. We don't make claims; we present the facts, backed up by well documented tests. How do we increase horsepower so consistently? It all starts with The World's Best Air Filter. Even a K&N replacement air filter is limited by the size of the original air box but once we remove the air box we've got plenty of room to work with. Now we can apply our High-Flow Technology to a large conical open element air filter, providing more surface area for huge increases in airflow that turn into horsepower you can feel. The oversize air filter also captures and holds more dirt. This increases the service life before a cleaning is required (up to 100,000 miles for air intakes depending on driving conditions). Improving the air path between the air filter and the motor is the next big area of improvement. We offer two options for many of our air intake applications. Part numbers starting with 57 or 63 (except Gen 1 and 57i Series) incorporate molded High Density Polyethylene tubes that are black in color. Part numbers starting in 69 or 77 have aluminum tubes and are polished, powder coated or anodized. Our molded Polyethylene systems offer us the most flexibility in air intake design and the best possible horsepower numbers. The aluminum intake systems offer power with a more stylish look. Many K&N Intake Systems are street legal in all 50 states and include a California Air Resource Board (CARB) Executive Order (EO) number that ensures the kit has been tested to comply with emissions standards. EO numbers apply to the kit as well as the year, make and model it is being installed on. Systems with no EO number are street legal in most states but may not be used on emissions controlled vehicles in the state of California or other states adopting California emission standards. K&N invented the world's first air filter guaranteed for one million miles. That same warranty applies to our High-Flow Air Intake Systems. Our products are well engineered, built with the finest materials and we stand behind them 100%. Sound complicated? That's the great part, our air intake systems are easy to install. A typical installation can be done with a screwdriver, pliers and a ratchet-set in 90 minutes or less! We specifically engineer our kits to use existing factory holes and mounting points, making installation simple. The vast majority of our cold air intakes do NOT require any cutting or drilling.